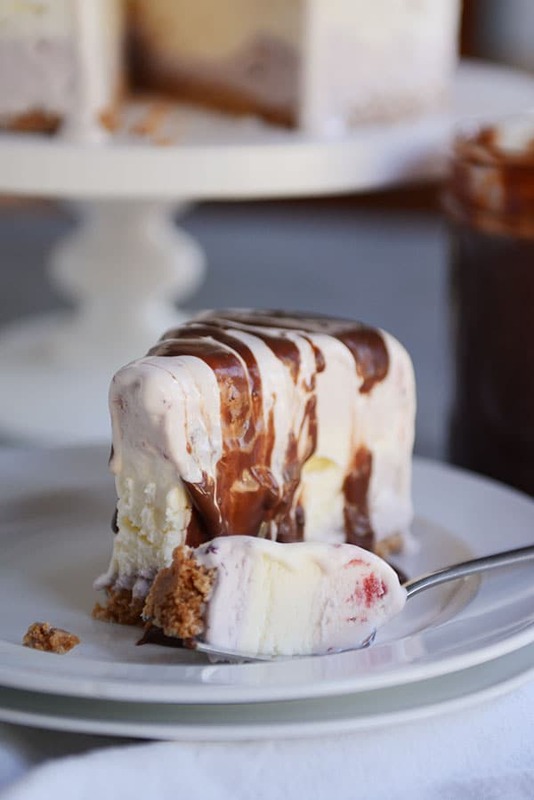 Quite possibly the easiest cake you’ll ever make, this layered ice cream cake with a buttery sugar cone crust is crazy delicious. And the possibilities for those ice cream layers are endless! What started as an attempt to make a festive, red, white and blue ice cream cake for the upcoming American 4th of July holiday, didn’t exactly work out as planned. 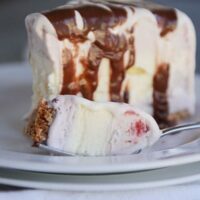 Sure, this layered ice cream cake is awfully delicious (I mean, how can you go wrong with layers of ice cream, right? ), but believe it or not, it’s kind of hard to find vibrant red and blue ice cream at my neighborhood grocery store. I wasn’t too keen on pouring vats of food coloring into homemade ice cream – or even making homemade ice cream, for that matter; slacker honesty at its finest. So, instead of a 4th of July show-stopper cake, I ended up with more of a humble, less in-your-face ice cream cake. Thanks to the colors, it might be more suited to…Easter? President’s Day? I’m not sure. We didn’t analyze potential holiday options since we ended up devouring it for Sunday night dessert. Yep. It’s as good as it sounds. I crushed up ice cream cones (the sugar cone variety), buttered ’em up and used the mixture as the base of this cake. It’s probably the second best decision I’ve made all month. 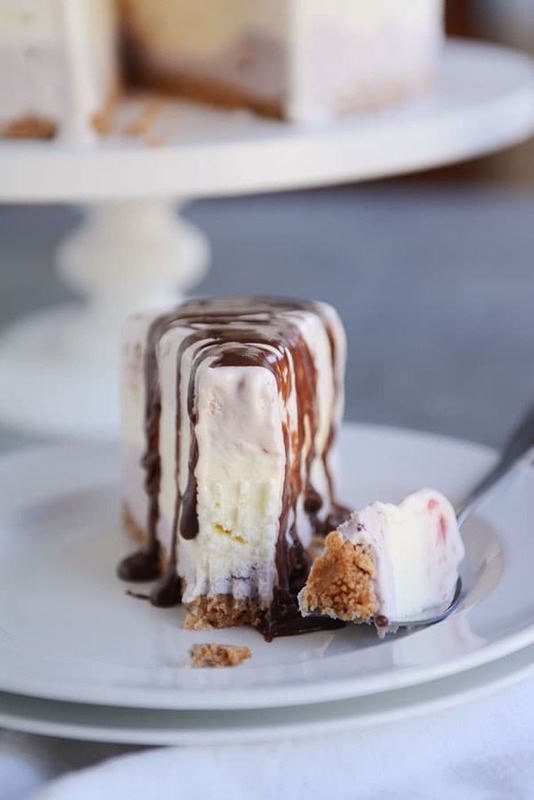 The best decision is smothering my piece of ice cream cake in hot fudge sauce. As I mention in the notes below, the ice cream options are endless here. You better believe the next variety I make will be some kind of all-chocolate version. Maybe cookie dough ice cream, moose tracks and chocolate fudge? Oh, yes. The only difficult part of this cake is waiting for each layer to freeze. And even then, if you want me to send you a to-do list of things to fill your time whilst waiting, please let me know. My kids will tell you I’m very good at delegating to-do lists to anyone who makes eye contact for too long. 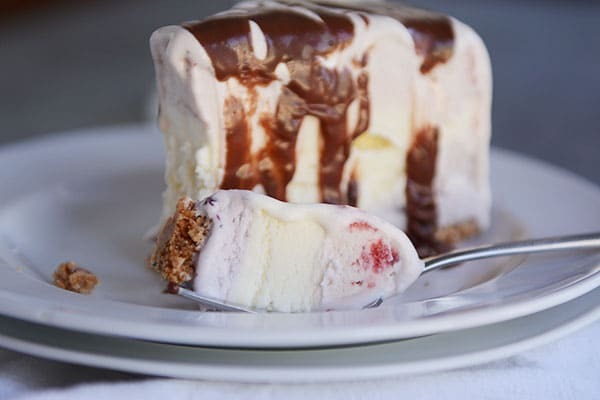 For anyone who struggles to make a decision about what kind of ice cream to dish up in their bowl, this cake is for you. And as I’m thinking about it, that sugar cone crust mixture would be divine sprinkled over a bowl of ice cream. Now that’s an idea worth pondering. In a medium bowl, stir together the crushed sugar cones, sugar and butter until evenly mixed. Press the mixture evenly on the bottom of a 9- or 10-inch springform pan (if using a 9-inch pan, make sure the sides are at least three inches high). Freeze for at least 20 minutes. Stir the blueberry ice cream until smooth (so that all the soft/melty areas are incorporated). Spread evenly over the chilled crust. Freeze until firm, about 30 minutes. Do the same with the vanilla ice cream and spread evenly over the blueberry ice cream layer; freeze until firm. Finish with the strawberry ice cream - stirring to combine and then spreading evenly over the vanilla ice cream. Freeze for at least an hour before covering the top with plastic wrap, otherwise it will stick and make a mess of the top of the cake. You can also serve at this point. Well-covered, the cake can be frozen for 1-2 weeks. Before serving, remove the cake from the freezer and let it sit at room temp for 10-15 minutes before unmolding the sides of the pan. For easier, clean slices, run a long, thin knife under hot water and wipe clean before each slice. Serve the cake slices with hot fudge sauce, if desired (or any other toppings worthy of an ice cream cake!). It totally goes without saying (but I'll say it anyway), but this cake is highly adaptable to different ice cream flavors so let your imagination (and grocery store options) go crazy. This recipe is shockingly easy - but you WILL need to plan time for each layer to harden in the freezer before adding the next layer. If you don't have a springform pan, you could probably make this in a casserole-type dish (like a 9X13-inch maybe?) or in a cake pan. Just make sure the sides of the cake pan (if using a 9-inch) are at least 3-inches high so you can fit in all the luscious ice cream. Next Post » 4th of July Menu Ideas! My daughter is wanting this for her birthday next week. (She opts for your desserts over a normal birthday cake–smart girl!) My question is: do you use the whole 3 quarts of ice cream in this case? Or just half of each one? 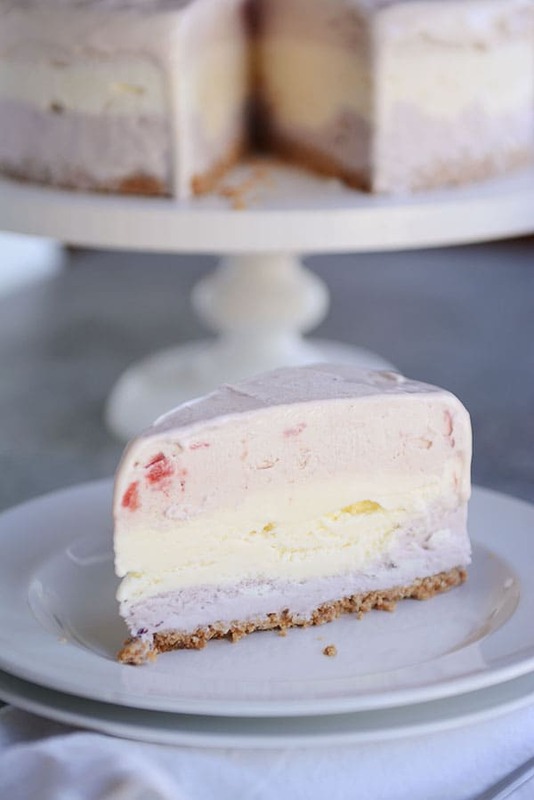 this has become our go to ice cream cake recipe. my family loves the sugar cone crust and we enjoy coming up with new ice cream pairings. thanks for the recipe! This turned out great for my sisters bday! Used chocolate, mint and chocolate chip. Loved the crust! The hot fudge was more labor intensive than other recipes but SO good! I seriously love the way you think! Yum yum yum. Sounds divine! Thanks Mel! I usually leave it out on my counter for 15-20 minutes. I’m thinking of trying a banana split version for my next dessert. Sliced bananas on the crust, then strawberry, vanilla, and chocolate ice cream. Topped with chopped peanuts, caramel sauce, and hot fudge. Then little dollops of whipped cream and a cherry. What a great recipe to build on! Pinned this for the crust and the method/quantities… I’m a chocoholic here, and I can see so many possibilities for this!! Sugar cone crust is brilliant! You could use a chocolate layer instead of blueberry and call it a Neapolitan ice cream cake. Love ice cream!!!! Here in the “great white north” we celebrate Canada Day on July 1st. I live in a rural part of southwestern Ontario. Nearby there is an ice cream company that has been making delicious ice cream since the early 1970’s. Chapman’s Ice Cream makes a flavour called “Canadian Vanilla, eh!” with the bright red maple leaf already in the middle. http://www.chapmans.ca/FlavourFinder/Canadian_Vanilla,/ The ice cream comes in a box. You peel back the cardboard and slice the brick of ice cream inside revealing the maple leaf! This looks so fun and easy! I love to bake desserts but it is so punishing on some of these summer days. Thanks for a cool alternative! !